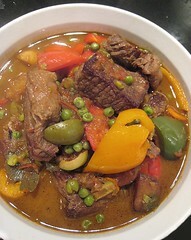 After the second day of our beef kaldereta (beef stew with bell peppers), there was still some left over. I personally did not want to have the same meal again on the third day, so we decided to let our beef kaldereta undergo a makeover and come back slightly different. 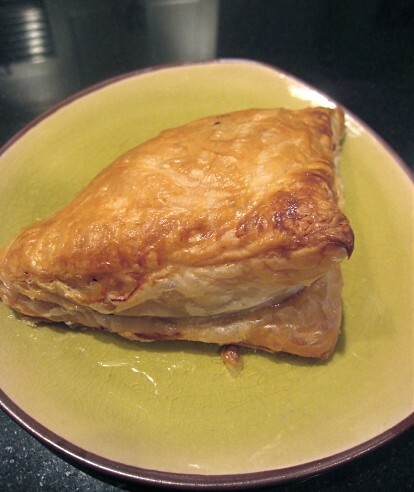 We had some puff pastry thawing in the fridge, its purpose as yet unknown. 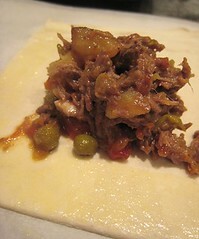 So, we decided to use it to make "empanada" with beef kaldereta filling. 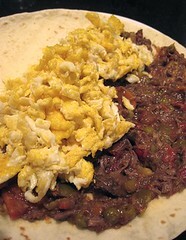 Because of all the reheating the dish had gone through, the beef had basically shredded itself. Less work for us! 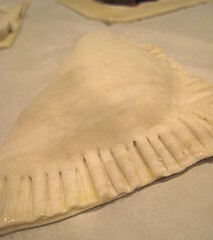 It was simply a matter of cutting the puff pastry to size, adding the filling, and closing each pocket. I brused the top with egg wash and they went into a 375 F oven for about 15 minutes to 20 minutes or so, until golden brown. 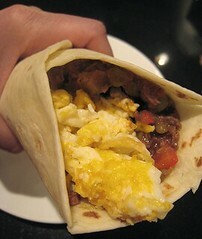 I simply filled a flour tortilla with some beef kaldereta and added some cooked eggs. I rolled the whole overfilled thing up, taking care to spill as little as possible of the filling. And so, with these two incarnations, we managed to finish the whole pot of beef kaldereta. Next time, we won't cook as much, especially when the star of the stew is not the meat itself but its sauce and entourage. Both of these look delicious on their own - reason enough to make the kaldereta! What a great use of leftovers. Oh, fantastic! I love repurposing leftovers -- and these look like two very clever ways of doing just that! 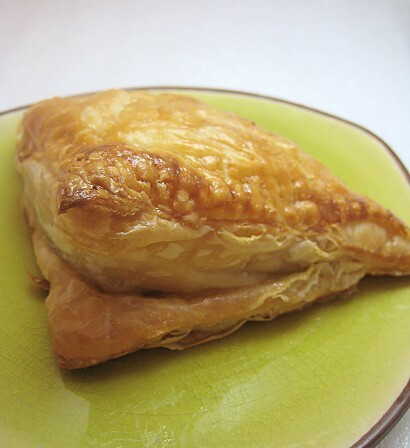 I'm drooling over the empanadas... wishing I could have some for dinner! Great idea for using meat leftovers you guys. I always make too much of any braised meat, so it's good to have even more options for leftovers! Bet you're glad the beef binge is over, too! You could give me some of those leftovers...! Next time perhaps we'll try making our own pastry (not pouff, though!). I would've said to put some in the freezer but JS vetoed that idea. This sounds insanely good. 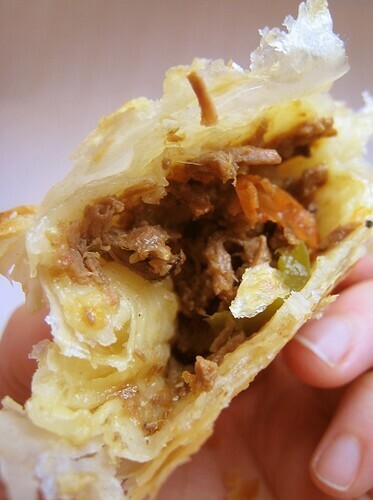 I'm all about goat kaldereta with rice but making it a pastry filling sounds even better. Thanks. I'm still very intrguied about goat kaldereta. I may have had it years and years and years ago, but I don't remember.